Dec. 4, 2018 (WASHINGTON) – Today, the American Tort Reform Foundation released its annual Judicial Hellholes report and named Louisiana as the No. 5 Judicial Hellhole in the country. 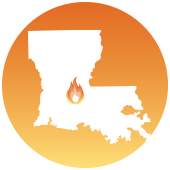 Louisiana earned its way into the Top 5 through the state’s hiring of contingency-fee lawyers to target energy companies and the legislature’s failure to address lawsuit abuse. Louisiana Governor John Bel Edwards, a former trial lawyer, came into office and quickly hired campaign donors and trial lawyer colleagues to represent the state in more than 40 lawsuits against energy companies. Governor Edwards filed the lawsuits after the companies would not comply with his ultimatum demanding that they spend billions of dollars restoring the eroding coastline of the Pelican State. Louisiana posted the worst economic performance in the country in 2017 according to the federal Bureau of Economic Analysis, and was one of just three states in which the economy shrank. Governor Edwards is not the only Louisianan needlessly filing lawsuits. The state also is a hotbed for lawsuits claiming small businesses are in violation of the Americans with Disabilities Act. The claims often involve serial plaintiffs and are filed without giving notice to the business owner, denying them the opportunity to address the issue outside of court. As of June, Louisiana was among the Top 10 states for these types of lawsuits in federal court in 2018. The problems don’t end with frivolous lawsuits – Louisiana also has the second-most expensive auto insurance rates in the country. Fifty-five percent of Louisianans drive uninsured or underinsured, encouraging drivers to turn to the courts for larger payouts when accidents occur. Trial lawyers then work behind the scenes to drive up payout costs on even the most minor fender benders, which then forces the insurance companies to increase rates year after year. Louisiana’s legislature had the opportunity to pass legislation addressing these litigation abuses, which would have made evidence that a person was not wearing a seatbelt at the time of an accident admissible in court. The current law in Louisiana does not allow the jury to consider this evidence when determining damage awards. The bill passed the House but died in the Senate. A recent report states that excessive tort costs in Louisiana resulted in a loss of more than 15,000 permanent jobs as of 2018 in addition to $1.1 billion in annual direct costs. Madison and St. Clair Counties, Ill.
To view the full report and read further updates throughout the year, visit JudicialHellholes.org. About the American Tort Reform Association (ATRA): The American Tort Reform Association, based in Washington, D.C., is the only national organization dedicated exclusively to tort and liability reform through public education and the enactment of legislation. Its members include nonprofit organizations and small and large companies, as well as trade, business and professional associations from the state and national level. The American Tort Reform Foundation is a sister organization dedicated primarily to research and public education. Posted on December 4, 2018 by Christopher J. Gary and filed under John Bel Edwards, Louisiana and tagged louisiana Louisiana Lawsuit Abuse Watch John Bel Edwards lawyers.